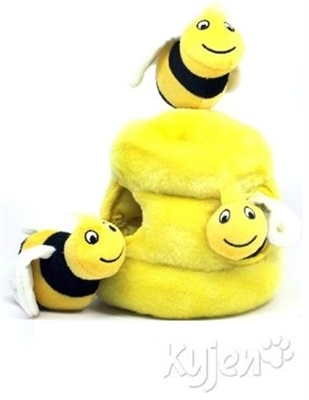 Hide-A-Bee Puzzle Plush™ Includes three plush bees with squeakers. 7"W x 7.5"H x 7"D - These Puzzle Plush Animal Puzzles are designed after nature's own puzzles. Only this time, Rover can catch that pesky animal! These toys will not only keep pets occupied and eliminate boredom, but they also develop a dog's intelligence and puzzle-solving skills. Just insert the toys or rings onto or inside the toy for dogs to remove over and over again. Durable and long lasting.